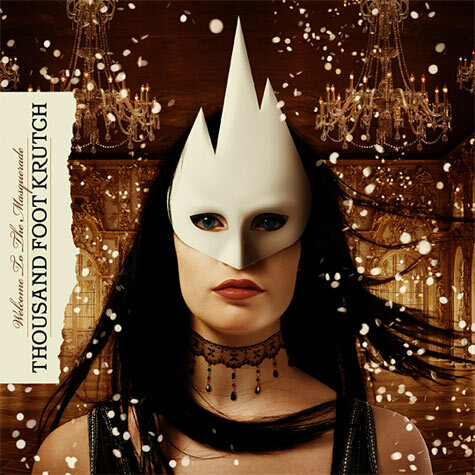 I've always been a big fan of Thousand Foot Krutch. Joel Bruyere, Steve Augustine and Trevor McNevan are true veterans when it comes to Christian rock; I wouldn't be surprised if they were one of Tooth & Nail's best and longest investments. I know every song, music video and album I've bought from them are. "The Invitation": Nothing special about this intro track, but at least it follows suit with the musical style of the rest of the disc. "Welcome to the Masquerade": Let the insistent rhyming begin- McNevan and Ben Burnley (of Breaking Benjamin) share an interesting songwriting trait in that obvious technique of short, short phrases. While it does sound forced, it doesn't sound bad. "Fire It Up": Nickelback-esque. Not in a derogatory manner, but simply because of the rock-anthem guitar. Released to mainstream radio, appropriately from the lack of straightfoward meaning in its lyrics. Catchy, though. "Bring Me To Life": Another commercialized rock song, although "BMTL" returns to TFK's nu metal roots. While Welcome to the Masquerade was meant to stray away from pop; it doesn't quite sound as though the band has achieved that. They're moving in the right direction, specifically in the vocally forced bridge. The chorus really softens the entire song, making it radio-friendly. "E is for Extinction": This is my favourite song on the album. Light, falsetto vocals at the start and a cyclic riff add depth. The tone is set at 30 seconds in, where the rock-garden sound is abruptly interrupted. Still going nowhere stylistically, the riff is probably the only reason I'm drawn to this song. "Watching Over Me": A slower ballad, exposing McNevan immediately. The change is substantial when comparing this track to "Breathe You In", another ballad, from 2005's The Art of Breaking. His tone is that much more mature, less whiny and pitchy, and Augustine's drumming is to be praised as well. "The Part That Hurts The Most (Is Me)": An easy-to-relate song, about what seems to be a dysfunctional relationship. Whether it is a literal conflict of person vs. person, a religious, metaphor, or person vs. society is left to interpretation. Strangely, I don't find that there is a distinguishing "this is TFK" ring. "Scream": Between this track and Tokio Hotel's of the same name, I prefer the latter. "Look Away": A sweet ballad, in which for the first time, Thousand Foot Krutch sound like a pop-punk-boy-band. The piano interludes are gorgeous, along with the string arrangement, and one has to forgive them. Look ma, my favourite pop-punk-boy-band song isn't even by a pop-punk-boy-band. "Forward Motion": Symphonic sounding and pretty much rock solid. This album is really just making me visualize boulders and stones. If the guitar on this track were given a little more light, it'd truly be huge and epic. "Outta Control": What this release is lacking? Rawness. There's no grittyness like there's been in the past, only the occasional refined, rock-sugary Chad Kroeger scream. Does refined rock sugar even exist? "Smack Down": I don't like this song. Maybe it's a girl thing, but this song is overly macho from the start before it suddenly drops into a "We Will Rock You" clap. In my opinion, bass presence is scarce throughout the entire album. "Already Home": I complimented them on the string earlier, but the opening of this is a little too much. It sounds like an orchestral piece. Pretty, but not ideal... the phrase holds true for all of Welcome to the Masquerade. I suggest listening thoroughly before you buy.